This month’s kit is jam packed with embossing folders! I think this kit is so much fun and, for me, a great reminder of some of my early cards (thankfully much improved these days). There are several types of embossing folders included and many great videos on the subscription site that cover embossing, debossing and inking tips and tricks. Sara Davies, the owner of Crafter’s Companion, has once again added so many wonderful things to this months kit. The February box has 115 items including 2D and 3D embossing folders! There are 8 embossing folders in all, a set of clear stamps, several pages of die-cut toppers, coordinating ribbons in 3 sizes, black and white cardstock, coordinating solid and patterned paper, and 3 different card sizes with matching envelopes. You will be able to make a minimum of 18 cards! This was delivered with auto-ship through HSN as always. You can check out Crafter’s Companion website for more information. This kit is truly a wonderful bargain. Each kit offers different items and will show you new techniques. There is a Facebook group that you can join once you subscribe which provides lots of community support and loads of examples; plus, Sara also has a monthly card kit site that you can refer to for demos/project pages. Other than some different types of ink, metallic markers, wax and a few embellishments, I didn’t need to use anything additional besides glue to complete these projects. I used a combination of tape adhesive and wet glue for most of the projects, but I also used a 3-D silicon glue to help raise some of my elements. Crafter’s Companion sells a 3-D glue gel that adds dimension depending on how thick you lay it on. I highly recommend this glue!!! You can add a little or a lot and you will love the results. I would also recommend the Crafter’s Companion glass mat. It is a true game changer. Once you work on a glass surface you will agree! So the first three cards were made with the same embossing folder but different inking techniques… I wanted to show you how different they can look using the same folder. The first card was made on black cardstock and I used a silver metallic marker (from last months kit) over the top. I used a left to right sweeping motion and a very light hand. I love that this looks almost like a chalkboard. For this next card I used Tim Holtz water color paper and distress oxides to water color the background in pink and orange (smooshing technique). Once it dried, I ran the paper through the embossing folder and lightly highlighted the paper with Spectrum Noir Wax in purple and pink. You really only need a very small amount but it turns out so beautiful! 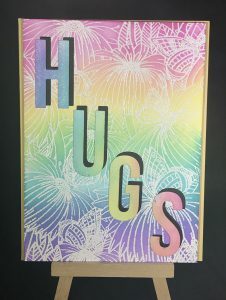 On this third card, I used the same embossing folder as the previous two, but instead, I colored each raised element with Spectrum Noir Metallic Markers. They are gorgeous and so easy to use. I followed the coloring up with a very light coat of the clear sparkle pen. These are water color markers so they will run if they get too wet so be careful! The color and shimmer on this card is amazing!! Onto some other examples…. I just love this next embossing folder. It has so much detail and looks like it took forever to make this card and in reality it was done in just a few minutes. I used the Spectrum Noir wax on this card in the silver and blue, added ribbon and a die-cut topper and it was done! It looks like foil cardstock but it’s plain old white paper. These last few cards all use the smaller sentiment embossing folders. Some I inked over and some I used metallic marker to color. For the left card, I inked the embossing folder to get the background in blue and then I lightly went over the top in green to highlight. And for the middle card, I used the border embossing folder 3 times over distress inked water colored paper. All of the effects are lovely and so simple. I hope you enjoyed all of these examples. Embossing folders are so simple to use and make a big statement. They can be inked, colored, used on plain or patterned paper; the options are endless. Please feel free to share your creations – I would love to see them!! Happy Crafting!! HOW do I subscribe to get this month’s box? HSN acted clueless when I contacted them about signing up and all they have on their site is a box of pens…. Hi Michelle I am not sure you can get this set now unless you already subscribed. I did see 3 older boxes on hsn.com that you can get now. I think the March craft day ( 5th or 6th) will probably have this box for sale. I hope that helps.